Founded by the poet Frédéric Mistral in 1896. It exhibits costumes, furniture, work tools, objects of worship, illustrating Provençal life in the 19th century. 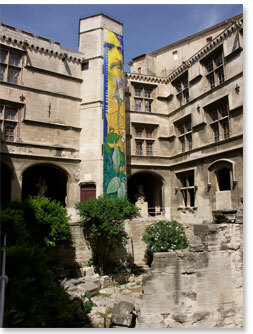 Arles has always been a city of traditions. In 1854 Frédéric Mistral and six other young poets founded Félibrige, a literary movement to defend and promote Provençal language. The quality of his poetry and the revival of interest in Provence earnt Frédéric Mistral the Nobel Prize for Literature in 1904. The money from this prize enabled him to rehouse the Museon Arlaten. This ethnographic museum displays everything that constitute Provençal identity through its daily details. It reveals the secrets of the Arlesian costume and the music of Provence, still alive and well in the 21st century: galoubets (flutes) and tambourines still set the rhythm of the farandole which often brings popular festivals to a close and during which people sing the Coupo Santo, the anthem of the people of Provence. The MUSEON ARLATEN, the Departmental Museum of Ethnography, housed in the 15th century Hôtel Laval-Castellane, founded in 1896 by the regional writer Frédéric Mistral, exhibits costumes, furniture, work tools, objects of worship and superstition, illustrates Provençal life in the 19th century. The museum is closed for work until 2019 but it continues to offer a programme extra muros.